Have you ever wished you could change your life? If you follow me on Twitter or Facebook you know that for the last 9 years I have been working at a job that I did not love. I spent some time last month talking to a very good food blogging friend and he made me realize that if I am truly serious about making food and recipes my future I needed to get on the stick! So, I left my old job and have taken a part-time job three days a week. This gives me four days a week to work on more cookbooks, freelance jobs, and this here blog! I am excited about this step, but scared at the same time. I am determined to make this work! Instead of just wishing for a new life, I am making my new life a reality! So, I want my new part-time coworkers to like me and I am not above bribes. 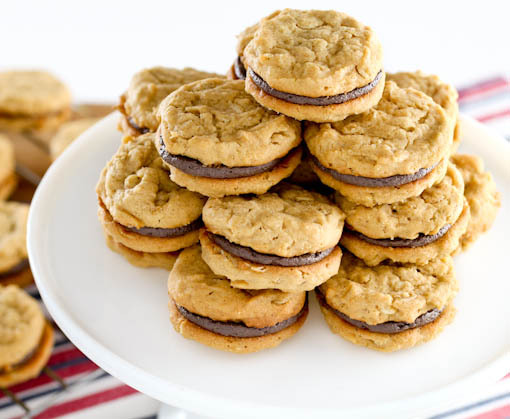 I went with the classic peanut butter and chocolate combo, and I went with sandwich cookies because they are cheerful and popular. 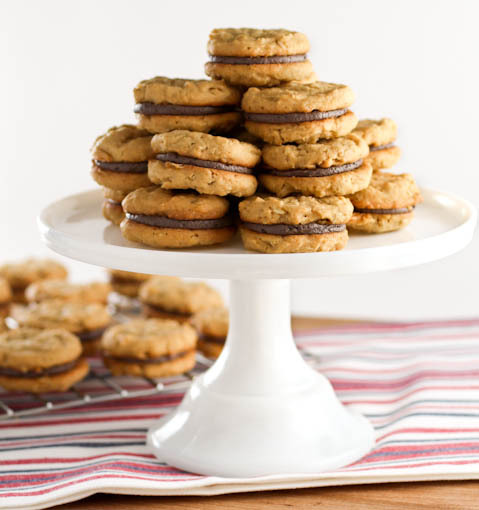 These are similar to the classic oatmeal cream pies, but SO much better. 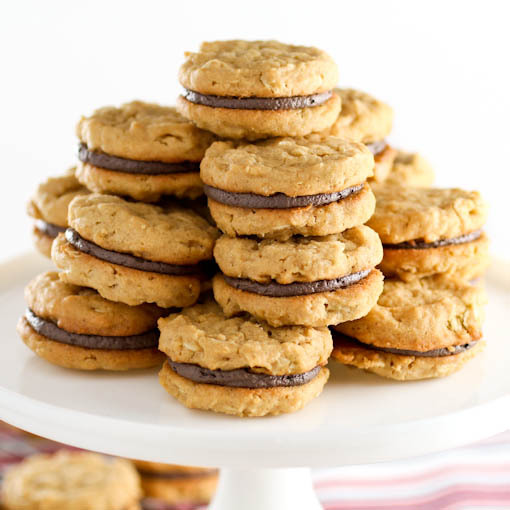 The cookies are tender and not-too-sweet, the oats add a pleasant chewiness, and the fluffy chocolate filling adds a nice contrasting sweetness. 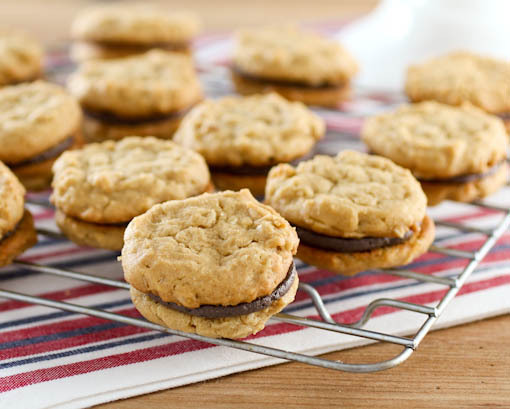 I wanted a good balance here between chocolate and peanut butter, sweet and somewhat savory, and tender yet chewy. Of course, I think I hit the nail on the head. When baking these be sure not to let them go beyond lightly golden to retain the soft texture. 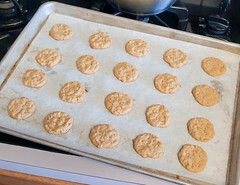 If you want a crisper cookie you could bake them 1 to 2 minutes more, but I like them soft. These keep pretty well in an airtight container for up to three days, but I doubt they will last that long! 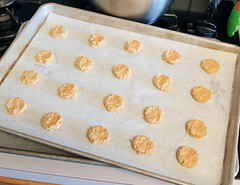 Heat the oven to 350 F and line two baking sheets with parchment paper. 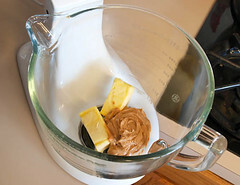 In the work bowl of a stand mixer fitted with the paddle attachment, or in a large bowl with a hand mixer, add the peanut butter and butter. Beat on medium speed until thoroughly combined, about 1 minute. 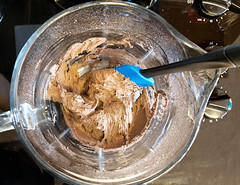 Add the brown sugar and sugar and mix until well combined and lighter in color, about 1 minute. 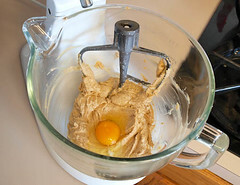 Add the egg and vanilla and beat on medium high until light and fluffy, about 1 minute. 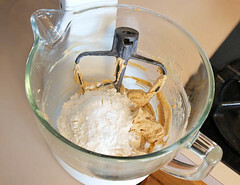 In a separate bowl combine the flour, baking powder, baking soda, and salt and whisk until thoroughly incorporated. 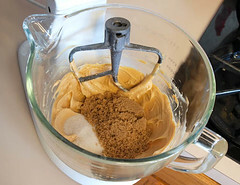 Add the flour mixture to the peanut butter mixture and mix on low speed until just combined, about 30 seconds. 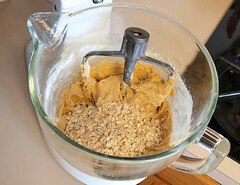 Add the oats and mix until well distributed, about 10 seconds. Scoop the dough onto the prepared baking sheet by rounded teaspoons at least 1 inch apart. Lightly press the tops of each dough ball to flatten. 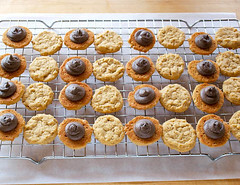 Bake for 6 to 8 minutes, or until the edges of the cookies are just becoming golden brown and the tops are still relatively pale but dry. Allow to cool on the pan for 10 minutes before transferring to a wire rack to cool to room temperature. While the cookies cool prepare the filling. 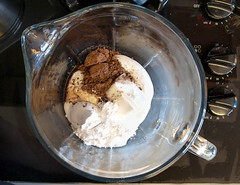 In a medium bowl combine the marshmallow fluff, vegetable shortening, powdered sugar, cocoa powder, and vanilla. Beat until the mixture is thoroughly combined. The mixture should be quite thick. Scoop the filling into a piping bag fitted with a medium round tip. To assemble the cookies turn half the cookies over. Pipe approximately 1 teaspoon of the filling onto the cookies. 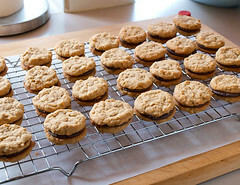 Top with the remaining cookies, pressing gently to help the filling spread to the edges.